If you follow me on Twitter or read the posts here on the blog, you know how I’ve been spending a lot of time thinking away on what to do with BFT. More specifically, what to do to make BFT better. Obviously, I’m not a “real” transit planner. However, anyone and everyone has ideas, and mine just happen to be about transit a lot of the time. As I talked about a few posts ago, rather than focusing on what I wish BFT could have, I’ve been focusing on what BFT can have within the limitations of the current financial resources. I’ve said many times that the Tri-Cities has been very lucky in avoiding the majority of the economic downturn, but its starting to look like that luck might be running out. It’s a wait-and-see game at this point, but if push comes to shove, things could get very ugly around here, and I’d hate to see what that could do to BFT. A while back, I posted a finished version of the map for my then-proposal for BFT. Looking back on it, my freshman effort was not that great. If I had to critique myself, I would say that my two biggest flaws were the directional arrows on every route marker, and the “rainbow.” (I don’t think I have to explain what “rainbow” means.) There are some people who like the rainbow, but in my opinion, it can be a pain on the eyes. When you have multiple colors in such a close proximity to each other, they tend to “bleed” into each other and can be very hard to look at. Plus, when you have multiple colors in use, it can make for some pretty big space consumers. Example, an old copy of the Dayton Street Transfer Point inset. (Link is to view the document via the Wayback Machine.) Another thing that must get serious consideration is accommodating people who are color blind. 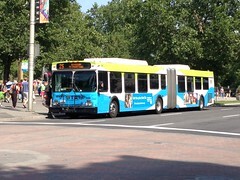 CHK America did a great job in addressing this issue when they did a recent revamp of the Spokane Transit system map. Last summer, I was on a red-eye flight between Seattle and Baltimore, and I may or may not have been awake for a period of time longer than what would be considered “normal.” During the flight, with free pretzels and free beer in hand (thanks to a stewardess who thought me being an organ donor was the coolest thing ever), I started writing a little “study” about selecting seats on the Greyhound (or really any bus out there), and this is what I ended up with. Obviously, I never finished it, and quite honestly, I don’t think I ever will. …it’s probably for the best. Mine is pretty simple. Years ago when I was still a young’un and living in Whitehorse, my Mom, sister, and myself were getting ready to leave our house in Riverdale and head up to Takhini for our youth league softball games. I can’t remember if it was because we only had one vehicle at the time, or if we had one in the shop, but for whatever reason, we had to catch the bus since my Dad was going to need the truck to go to work. Though the bus stop was only 400 feet away from the front door, we ended up missing the bus by just mere seconds. We ended up having to take the truck, and somehow or another my Dad got to work. I blame my sister’s always prevalent ability to be slow at getting ready, though I think I might have had a bit of the blame on that day. Several days ago, King County Metro launched their newest “BRT” (Bus Rapid Transit) line, RapidRide B, which runs between Bellevue and Redmond. (I use the term BRT cautiously, as there is a huge debate whether the RapidRide lines deserve to even be called that.) On my Twitter feed, I saw a post from @oranv about how the route travels through a roundabout, making it the only frequent-service route in King County to do so. 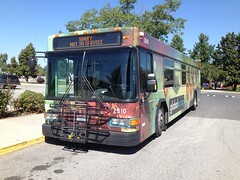 In Kennewick there’s a bus route, Route 47, that fully utilizes a good chunk of the city’s roundabouts. Along it’s route, it crosses through not one, not two, but five different roundabouts. Often times, you’ll hear users of public transit complain that the people who are behind the design of the system are screwing them over, because the designers don’t use the transit themselves and don’t have to care about the “needs of the people.” It goes hand-in-hand with the usual NIMBY attitudes that are prevalent everywhere, but regardless. 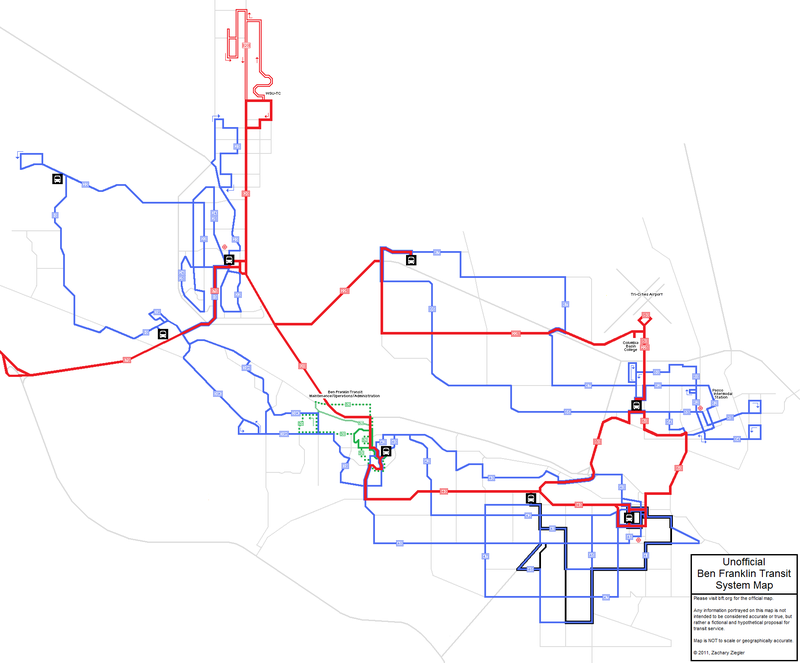 What most fail to consider is that a lot of thought goes into the design of a transit system. Beyond the modes used, decisions have to be made about vehicles, costs, traffic impacts, demand, low-income needs, commuter needs, and so much more. The sad truth is that everything costs money. (Where that money comes from is a whole different discussion.) With the way things are today, more and more transit agencies are having to make tough choices to cut back service, lay off employees, or even shut down completely. It’s not something I personally keep track of, but I believe there’s been a few this year that bit the dust. More famously, Colorado Springs (pop. 416,427) eliminated all evening and weekend service on January 1st, 2010. Earlier this year, they were able to reinstate some of it, though it is nowhere near the pre-recession levels. If you’ve ever heard the term Armchair Architect (or really any other infrastructure related job), you know that there are always those people who “know” how things should be done. Few truly do. Of those few, how many do you think would actually go through and show why they believe their idea is the right one? Public transit allows people to travel to destinations within a city or metropolitan area. But when someone wants to travel to another city outside of their area, what options are there? You could drive. Sure. As long as you have a car, which means you’ll be paying for gas, insurance, registration fees, and unless your a driver that indiscriminately follows the speed limit, speeding tickets. Maybe take a flight. …right. Airline travel is good when you need to get from Point A to Point B in a short amount of time, but it comes at a hefty price. Key word “hefty.” The average airline ticket price is hovering around $250 right now, and it still continues to rise. And that’s not even counting baggage fees, time spent getting to the airport, and all the time it takes to get through security just to get to your airplane in the first place. Ride the train. Perhaps. If you live in the Northeast of the country, particularly the “megalopolis” of Boston-NYC-Philadelphia-DC, then Amtrak is a great option. But most people don’t live in the Northeast. Train service is sporadic at best in most of the county, especially west of the Mississippi River. Though things are improving in the Pacific Northwest and California, there’s still a long way to go. That leaves only one option: the Intercity bus. 170 miles. 4 buses. $7. Welcome to the highest levels of frugality. On August 2nd, myself and comrade @iAndrewPippin embarked on a trip that took us from the Tri-Cities to Walla Walla and back via Hermiston and Pendleton. Now, most normal people sleep during the hours of the night, particularly before any travel. But as for me, I stayed awake. All night. Watching Scrubs. At about 4AM, I walked from my house towards Huntington Transit Center, meeting my buddie enroute and grabbing some snack food. After a healthy meal consisting of an apple juice and a Sourdough Jack with no tomato, we headed over to Huntington TC to wait for the Tri-City Trolley. The bus showed up close to on time at 5:39AM, and we boarded along with a gentleman who I’ve given the nickname of “Old Man Jenkins.” I’d say with about 99% certainty that there was alcohol running through his veins in the morning. Luckily, he slept nearly the entire ride. 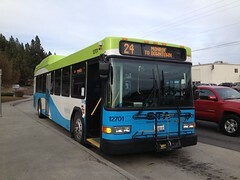 After boarding, we headed up to 27th Avenue Park and Ride, the last stop in the Tri-Cities, where another woman boarded, and after holding for about 5 minutes (to maintain the published schedule), we were on the highway.